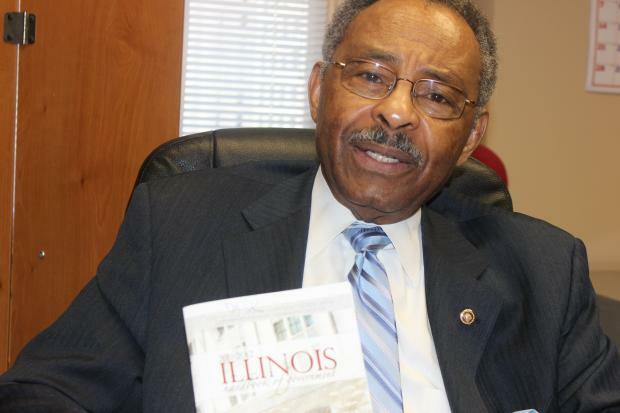 WEST CHATHAM — Roland Burris has seen a bit of everything in his career — including finishing out the U.S. Senate term of Barack Obama after Gov. Rod Blagojevich tried to sell the appointment. He's been a trailblazer in Illinois politics. His tombstone, already in place and awaiting his arrival, even has "trailblazer" carved into it. So, there should be plenty of interesting things for him to teach at his new Burris School of Politics, which he said is needed in the black community. "There is a lack of knowledge in the black community about how local, state and federal governments were created and how they operate," said Burris, 75, a Chatham resident. "I tried staying retired, but I couldn't see myself sitting home all day doing nothing." The one-week course, which launched in October, runs from 5 p.m. to 8 p.m. Tuesdays through Thursdays at the Stewart Business Center, 400 W. 76th St. The next scheduled class, which costs $50, runs from June 18-20, and reconvenes in September. Burris said his class will even make house calls. "I am willing to bring my class to any group that signs up 10 or more people," Burris said. Before moving the school to its current location in January, Burris held classes in rented office space in Bronzeville and Chatham. "They receive a wealth of political knowledge in nine hours," Burris said. "We average 10 students per class but could accommodate up to 30." The class offers no textbooks beyond a copy of the Illinois Handbook of Government issued by the Secretary of State's Office. Burris said he lectures to students about everything from the roots of the Democratic and Republican parties to the formation of the state and U.S. constitutions. The former state comptroller and attorney general said students ask many questions about his political career, especially the 23 controversial months he spent as a U.S. senator. "Students want to know what was President Obama like and what was it like working in Washington, D.C.," said Burris, who hopes to complete a memoir about his political career this year. "The questions are endless, but I don't mind because it is my way of sharing my knowledge with others." Burris was appointed to fill Obama's former U.S. Senate seat in 2008 by Illinois Gov. Rod Blagojevich — who was convicted of trying to sell the seat to the highest bidder. Burris insisted that Blagojevich never tried to sell him the seat or ask for any favors in return. "I can't speak for what he may or may not have done with others, but I can tell you he never tried to sell me the seat," Burris said. Burris said he hopes his class will be picked up by a university, but for now he plans to continue offering the classes on his own. "Next up is to have guest speakers come to my class. That's down the line though," Burris said. Burris also is working as a private attorney, handling real estate, probate and estate-planning cases. "It would have been nice to still be working in Washington as a U.S. senator. I really miss it," he said. "But by no means do I have plans, nor do I have any ambition to run for elected office again. That part of my life is over."